Mozilla plans to launch several password manager and password related enhancements in the upcoming Firefox 67 Stable release. The features, which are already implemented in Firefox Nightly, the cutting edge development version of Firefox, improve password functionality in three main areas. Firefox's password manager works similarly to the password manager in other browsers. Users may use it to save logins and auto-login into sites using the saved logins. Firefox users can import and export passwords, and sync them across browsers. Current versions of Firefox lack functionality that other browsers, e.g. Google Chrome, support. Chrome comes with an option to disable automatic sign-ins. Firefox does not support the option right now in the stable version but will include the option when Firefox 67 is released. 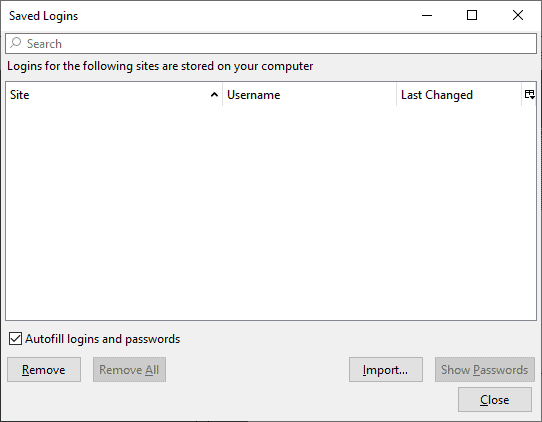 Just open about:preferences#privacy in the browser's address bar and click on the "saved logins" option under Logins & Passwords. You find the new "Autofill logins and passwords" option listed there. It is checked by default; Firefox will fill out logins and passwords automatically just like it did in previous versions. Firefox users may still fill out the saved passwords on sites manually if they decide to disable autofill functionality. Firefox 67 highlights auto-filled passwords with a yellow background on sites automatically to indicate to the user that this was done automatically. Firefox does not offer to save username and password in private browsing right now; this changes as well in Firefox 67. Firefox prompts you to save username and password when it recognizes login events in private browsing windows just like it does in normal browsing windows. The browser won't get an option in Settings to disable the functionality. You can change it, however, using a preference. Double-click on the preference to toggle its value. A value of True means that Firefox captures login events in private browsing windows and offers to save the login data, a value of False that it won't. Mozilla plans to release Firefox 67 in May 2019. Normally, I do safe pw in the browsers pw-manager, but only for less risky sites, like ghacks.net, magazines, twitter , but never for my bank, credit card cy., social security etc and more very personal websites. That way , I don’t have to remember or manual load to many pw’s and only those few that have strong pw, which I normally copy/paste from my personal pw-manager; filed encrypted on by computer and my notebook, not in the cloud, and with a monthly back-up on a USB. Same as @ard. I use the browser’s (Firefox here) built-in password manager with the exception of highly confidential credentials (bank, administration, CIA, etc.). I’m aware using browsers’ native password managers is not the best security wise option (hence the exceptions) but it’s so handy. Firefox 67 announced password management enhancement is welcomed of course but I’d be happier if its encryption were enhanced as well and mainly that of the master password which I believe is said to still be problematic in terms of encryption. Nice Improvement,…but done with FF, also Chrome itself, using Opera from now on, Brave as Second Unit. …and then only two are mentioned. I like reading gHacks from time to time, but this is just one small example of the overall sloppiness that characterizes almost all recent posts here. The writing style is sometimes so careless that I just stop reading the article altogether. Not here to whine, I’m just trying to point out here that taking more care in this area could really improve gHacks. I mentioned all three: highlight autofill, option to disable autofill, saving passwords in private windows. No, primarily because I don’t always use the same machine or browser, so it makes no sense to use a password manager that’s tied to specific machine or browser. Also, I prefer to keep my password list outside of applications that communicate over the internet.